MITCHELL Road appears a good thing on paper at Wagga on Saturday but trainer Chris Heywood is certainly not declaring the top weight. Mitchell Road will return for his second run back from a break in Saturday’s Blackwoods 2016 Christmas Gift Handicap (1200m) at Murrumbidgee Turf Club. Mitchell Road finished seventh in the $500,000 Country Championships Final (1400m) at Randwick last year and drops back to Sky Two grade for the first time in about 18 months. The six-year-old resumed with a sixth placing, beaten three lengths, behind Matilda Bird in the MTC Mad Scramble earlier this month. Heywood said it certainly is not a case of Mitchell Road simply needing to turn up to win. “I would never say that. I’d say it is a stepping stone to where we want to go with him,” Heywood said. “There was no real other suitable races for him. He’s got a lot of weight compared to everyone else and he’s not fully wound up yet either. Lily Coombe’s claim helps Mitchell Road carry 58.5kg, but he will still give all but one of the field at least four kilograms. Mitchell Road, owned by the Cheney family, not only raced in the Country Championships last preparation but also the Town Plate at Wagga and the City Handicap at Albury. Heywood has not picked anything out for the Magnus gelding just yet but would love to give him another try in the city. “We haven’t yet. The aim is to get him to town this time, now that Nick (Heywood) is there and going good. With his three kilo claim, we’ll be trying to find a nice race in town for him,” Heywood said. “We’ll give him a break and then bring him back to have a good crack at the Town Plate. When we got to the Town Plate this year, he was at the end of it after a long campaign. Heywood also has Delivered and Miss Iwannabe racing at Wagga on Saturday. While he labelled Miss Iwannabe is a work in progress, he believes Delivered can make his presence felt in the PAH Innovative Construction Benchmark 60 Handicap (1050m). “He’s a nice horse. 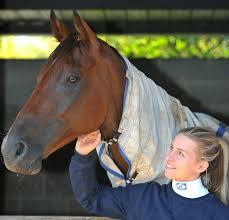 Obviously he’s up in grade but his work’s been good and I’m very happy with him,” Heywood said. “I’ve kept him fresh. Last time, he ran really well first-up, missed the start second up and then did nothing after that, in higher grade I must admit. Heywood labelled Hercule’s Horse as the one to beat.